This is likely one of those posts that benefits me the most, but here are a couple XenDesktop tips to consider. 1. Will Citrix Studio ever launch?!?! In this case, I was launching Citrix Studio from my XenDesktop delivery controllers so I made the changes on those servers and it did reduce the time needed to open Citrix Studio. 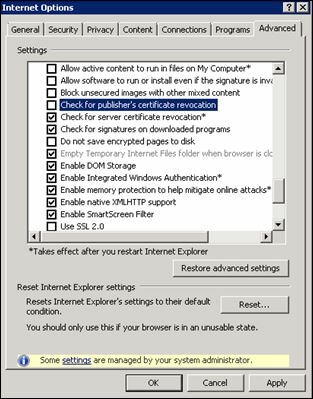 On a side note, I’ve also seen the Citrix StoreFront site take a long time to open on client machines using IE…just simply waiting for the StoreFront site to launch, just to get a logon prompt can take a while and disabling the check for publishers CRL helped decrease the wait time on the client computers. I had some older zero clients I had to connect to XenDesktop 7 virtual desktops, but I could not get them to connect to the virtual desktops through the StoreFront server so on my existing WebInterface 5.x servers, I added the XenDesktop 7 Site as an additional server farm. Afterwards, my zero client was able to using the 5.x WI to launch the XD7 virtual desktop, however, it would launch it and then disconnect almost immediately. This same behavior was displayed when connecting through the StoreFront server on any PC. I had XD7 running for about 3 weeks without this issue but the issue was traced by to Workspace Control on the WI 5.x XenApp Web and Services sites. As environments move away from XenApp 6.x and WI 5.x, my guess is that this type of problem becomes less common but if you’re integrating older zero clients with XenApp 6.x, WI 5.x, and XenDesktop 7, you may come across it. This is because of the Auto Reconnect feature of Web Interface. So when you logon to the desktop VM, inside the vm the online plugin will start and see that you have a connection open to a VM (it’s not smart enough to see that the connection goes to himself ). 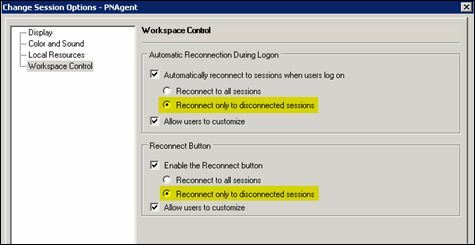 When web interface workspace control is configured to Auto-Reconnect active sessions, it will basically reconnect to itself and you are disconnected. Solution: in the PNAgent web interface properties, within workspace control set it to only auto reconnect disconnected sessions, not active sessions.